The media enjoyed positing Sara Jacobs, 29, as the ultimate Millennial candidate. She ran for the 49th district congressional seat after Republican Darrell Issa retired, and Jacobs’ hat was in the ring for a race that was wide open in both parties. Her age garnered her lots of attention—as did her endorsement by EMILY’s List, whose president Stephanie Schriock called Jacobs a “passionate, energetic leader” who will “deliver a fresh, new approach to government that creates economic opportunity and works for Southern California families.” Jacobs credited EMILY’s List with recruiting her to run after an unpaid stint with the Clinton campaign—no other women were gunning for Issa’s seat, which pundits think is within Democrats’ reach. 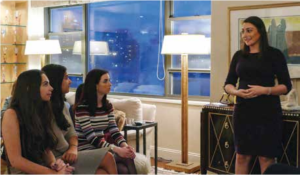 Cosmopolitan’s Rebecca Nelson profiled Jacobs, in a piece replete with sassy animated gifs of the candidate in action and lines like this: “She tells me she’s a Charlotte, likes to use the poop emoji, and is steeped in ‘America’s Next Top Model’.” At a campaign event at a bar, the article gleefully notes that Jacobs has to send someone back for her ID so she’ll be able to buy a drink. But Jacobs shares a lot of her generation’s concerns: smashing the patriarchy in its minute and larger forms, fighting against income inequality. And her path is tricky. She has to walk the line between pushing back against the stereotypes that constrain women candidates while also remaining appealing to voters who may be influenced those stereotypes. And at the same time, because Jacobs is the daughter of prominent donors, her rhetoric around inequality is not going to have the same “smash the system” quality of a Democratic Socialist type. “It’s my responsibility to use [my] advantages and opportunities, and use the privilege that I have and the position in this unfair system, the access in that unfair system, to make the system fairer,” she told Cosmopolitan. Opponents have accused her of embellishing her experience, since some of her stints as a young political type were merely months-long.